These posts include innovative window covering products, as well as events and how-to guides for getting the most out of your window treatments. DIY Film: Should I Do It Myself? 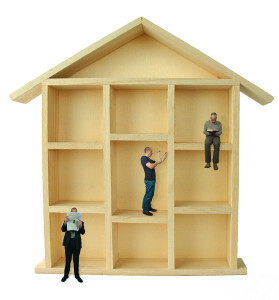 People love the challenge of trying to do it yourself (DIY) when it comes to home improvement. Programs like HGTV make it look easy, but they have a crew of qualified experts working on every project. Can installing your own window film save you money? Yes and no. Yes, if you have the time and patience to install the DIY film correctly. It may look easy when you see a professional do it but window film can be tricky to work with—even for our seasoned installers. It’s hard to avoid annoying bubbles, spots, creases, and peeling especially if you don’t have the proper tools, practice, and training. What happens if you don’t get it right the first time? The DIY film that you pick up at home improvement centers isn’t the same quality of film and comes without a warranty on installation problems. You only have one chance to get it right. Professional window film and installation carries a lifetime warranty on the film and installation. The films used are top quality and made to last. So you have to ask yourself, what is my time worth? Is it important to have a warranty? What quality of film am I willing to invest in my home? The value of a top quality product, properly installed with a lifetime warranty is far superior to what you can expect from DIY film. If you are considering installing DIY film or would like to learn more about the benefits and possibilities of window film in your home, we’d love to help. Contact us or call 858.332.1650 for a free consultation. Window film is often sought after for the comfort, security, and energy-saving benefits it can provide to a home or business. What many people don’t consider are the ways it can be used to make a space more attractive, inspiring, and personal. Decorative window films come in a wide variety of styles and can be customized to fit any space or application! 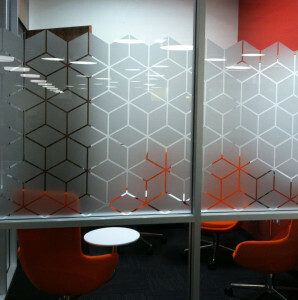 We outfitted DART Neuroscience with custom window frosting for their interior conference rooms. This tasteful geometric pattern adds style and the right level of privacy to their meeting spaces. We like to think this will inspire advances in neuroscience, but we know it advanced the ambiance of the office! View the gallery to follow along with the Eco Tint and Shade installation team. For more information on custom window frosting or other commercial window tinting, contact us today for a FREE consultation at 858.332.1650! Summer is here and buildings with outdated single-pane windows are heating up like a greenhouse. To replace or not to replace? That is the question. Energy efficiency is one of the main reasons you would consider replacing your existing outdated windows. Another reason may include the cost for maintenance and upkeep, especially for wooden window frames. Poor insulation can also make being inside uncomfortable. However, window replacement is costly in both time and money. If you are a building manager this will disrupt the work environment of your tenants. If you are a homeowner, finding the perfect time and weather to completely change out all the windows in your home is extremely difficult. And how do you measure the typical payback? Most experts agree it takes 15-20 years to see a return on your investment for window replacement. Let’s examine a few alternatives that aren’t as hard on your schedule or your wallet. Most older windows are single pane, which drive up energy costs by allowing heat to escape in the winter and magnifying heat during the summer. To avoid window replacement without losing money out the window, you can apply a solar film that reduces heat while protecting inhabitants and furnishings from harmful UVA rays. 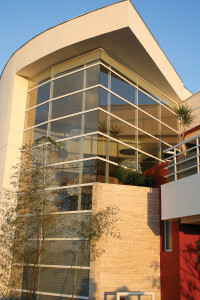 Commercial window films also encourage more consistent temperature flow throughout the building. Solar / low-e window film can be applied to the interior of your windows by a professional and is backed by a manufacturer’s warranty. SDG&E offers a rebate of $1.35 per square foot in the state of California, which is a HUGE discount. Hopefully we have given you some food for thought when it comes to considering a complete window replacement or using window film to retrofit and upgrade existing windows. We also offer free energy audits that determine the typical payback for a commercial building allowing you to base your decisions on which method would be most cost effective. Give us a call at 858.332.1650 for your free consultation! Spring is here and it’s the perfect time to start preparing your home for the warmer months ahead. Think of window film like your sunglasses. Both will protect you from the sun’s harmful rays, but film has the added benefit of reducing summer energy usage and keeping your electric bill low. Saving energy during the summer is easy and cost-effective. Follow these tried and true tips to save energy while reducing your energy costs. Air conditioning is one of summer’s biggest energy drains. By setting the thermostat to 78 degrees or higher you can save up to 12% on cooling costs. Everyone has an overhead fan or a box fan tucked away with those summer outfits. Using a portable or ceiling fan can help you save by circulating cool air and increasing air-conditioner efficiency. Check your AC filters, are they dirty? A dirty filter makes your AC work harder, draining energy and increasing costs. Change dirty filters and mark your calendar with the recommended schedule for filter replacement. Do you have drafty doors or windows? Precious cool air can escape from these tiny openings. Protect against drafts using weather-stripping or caulk and you can save up to 5% on cooling costs. DVRs, game consoles, coffee makers, and adapters for your phones and TVs draw power even when switched off! Use power strips or unplug these electronics when not in use to stop them from adding to your energy costs. Make sure when you switch out light bulbs to replace them with LED’s or CFL’s (compact fluorescent lights), which use up to 75% less energy than traditional fluorescent lights. Pools and spas can be an oasis during hot summer months, but also a major drain on utilities. By using coverings you can reduce head loss by up to 90%! Filtering your pool can also raise your energy use and costs. Filter your pool for less when you switch to an energy-efficient, variable speed pool pump. SDG&E offers rebates! SDG&E have online energy management tools. 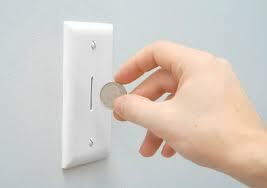 Start saving and be energy conscious today! Find all the rebates that you can take advantage of to save energy and reduce costs. Saving energy and reducing costs this summer is easy, contact Eco Tint and Shade to get started! Companies that commit to going green often are popular amongst investors and the community. These companies are committed to green measures, reducing their utility bills while adopting a more pragmatic approach to energy efficiency. This undertaking includes reengineering their business processes and operations. These companies also invest heavily in research and innovation reducing the overall cost of production. This gives them a competitive edge over other firms, attracting a host of new investors. Low attrition rate and high employee morale is the music to the ears of any HR department. Oftentimes, companies that commit themselves to sustainable ways of operating the business have a high rate of employee productivity. Encouraging innovation is one of the many reasons for high employee morale. Green buildings that use special materials like solar window films protect residents and staff members from harmful UV rays, thus improving their overall health. Many California buildings are special LEED certified to provide better quality of life and reduce overall illness often caused by a lack of Vitamin D. This helps a building attract more tenants and higher rents in the long run. In commercial and industrial buildings, workers take less number of sick leaves improving productivity. Other benefits for energy efficiency include tax rebates you can claim when filing for your taxes. Many California commercial property owners who install energy saving products such commercial window tinting and insulation already can claim tax deductions. If you are going for a massive green renovation, you can save as much as 30% of the total cost of installation and labor as a deduction from federal taxes. VISTA Window Film to their customers. San Diego–Are We In For Another Hot Summer? Who Said Privacy Has to Be Boring?